There comes a time in every toy collector's life when he or she will be faced with a question. It is a rite of passage for toy collectors, and if you haven't reached it yet, you will someday. For yours truly, the event occurred just the other day. The question is this: how much are you willing to pay for a figure...for something that is ultimately, essentially, despite all rationalizations to the contrary, nothing more than a toy? A plaything. For some people, they asked and answered this question long ago, and the answer was an easy "a lot." These are the type of people that have no problem buying giant Sideshow 1/4th scale maquettes for $999. For some of us though, the question is a troubling one. My usual limit for toys hovered around $30, with occasional exceptions up to the $50 range. But when I stumbled upon a Hot Toys 12" scale Celtic Predator at my local comic store, I was struck by the aforementioned conundrum. The figure promised all kinds of goodies beyond my wildest imagination, but could I really justify spending $130 plus tax? I don't even like paying $17 for DCDirect figures. But something about this figure...I wanted it. You'd have to be crazy not to want it. I remembered when the first photos of these 12" Alien Vs. Predator figures made the rounds on the toy message boards. One person's comment struck me in particular. I don't remember who said it, or even what board it was on, but it went something like this: "If you consider yourself a Predator fan, you'll find a way to buy these, no matter how much they cost." So I went for it. I took the leap. Joined the $100-figure club. And lived to tell about it. But do I regret it? Well, I'll tell you one thing, for a while there, I almost did. As I was checking out, the chick at the counter congratulated me on my awesome purchase, but the purchase came with a caveat: "Some guy brought in the one he bought, and he said it took like an hour and a half to put together, but once you get it together, it's freaking awesome." At the time, I scoffed at the notion. 90 minutes? Surely not. This wasn't some 500-piece scale model, it was an action figure. Well, when I got home and opened the thing (or rather, two hours after I opened the thing), I realized I just might have scoffed a bit too soon. Putting this thing together is something I would not wish upon my worst enemy. The thing comes in pieces and must be assembled. The main body is together, but the forearms and calves must be plugged into the body first. Then, you take the netted bodysuit...what? Yes, the netted bodysuit. This thing comes with a damn netted bodysuit, that must be unbuckled in the back and forced up onto the figure's body. This was by far the most frustrating part of the whole ordeal, so I suppose it's good to get it out of the way first. But it's ridiculously arduous, and for $130 you'd think it would come with someone to help me. Instead, we get ridiculously vague instructions. When there are words at all, they're colorful, to say the least. For example: "When dress up, pay attention to Predator body's embossed texture." Ah, Engrish. The gist is "be careful with the netting." And for $130, you bet I was careful. After a long, tedious, curse-filled battle, the netting was finally on. It didn't look all that great, but I chalked that up to the fact that "Predator body netting is a handmade product", as the instructions put it. It wasn't picture perfect, but after the battle I had just fought, I was ready to move on. Attaching the rest of the outfit wasn't too bad, except when a peg broke off of the chest armor and I almost shot myself. Luckily, it was a separate, glued on piece that just required re-gluing. Did I mention I spent $130 on this thing? I never really did get the shoulder armor to fit like it does in the picture, but it looks passable. I mean, there are straps and buckles on this thing. Tiny buckles and straps that actually tighten and loosen. Like I said, I wouldn't wish constructing this thing on my worst enemy. But at last it was finally complete... at one o'clock in the morning. And with the painful details of the assembly out of the way, I can finally get to the meat of the thing. First off, let me say that the sculpt is phenomenal. 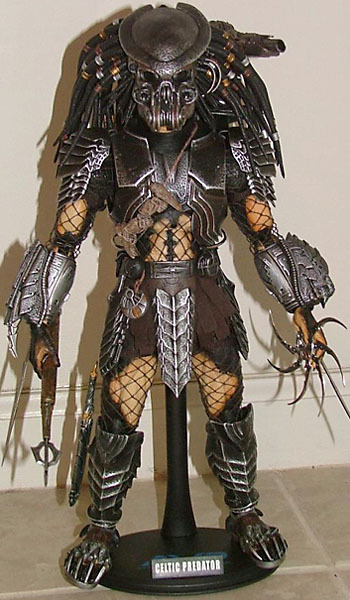 Unlike most 12" figures that often share a basic body, this thing was specially designed to represent the body of a Predator. The only figure that shares this body is the Hot Toys 12" Scar Predator, which is forgivable because it's almost the same figure, from a design standpoint. The skin is textured, knobby and scaled where it should be. The armor is pockmarked and pitted, like forged steel. The head sculpt is right out of the movie. The closed mandibles, which you may expect to be molded as part of the head, are actually separate (at least the top ones are) which preserves the appearance of a real mouth, since the tusks overhang the mouth with some space in between. The head sculpt is so good that it's hard to decide if the figure should be displayed with or without the mask, which is equally well-sculpted and fits perfectly. Many have complained that the head is far too large in proportion to the body. I think that those people are used to the typical representation of these characters in toy form (and statue and bust form, for that matter). In those types of 3D media, the head is typically made smaller, neglecting the fact that for the actual movie, the creature's head had to be large enough to fit completely around a normal human's head. Thus, movie Predators have disproportionately large heads, and this figure accurately represents that. In addition, the head is nowhere near as large as it originally appeared in publicity photos. Paint is also exceptional. For the first time since I can remember, my obsessive-compulsive, over-analytical scrutinizing of a figure's paint job has not turned up a single grievous error. Well, there was a tiny spot of light color where a dark bit of paint chipped off, but that was it. A small dot from a permanent ink pen took care of that. The paint job overall is nothing short of stellar. One aspect of the paint in particular stands out, however. Any surface that is meant to represent a blade (and there are many such surfaces on this figure and its accessories) is given a finish that resembles brushed aluminum. Somehow this effect was made possible on a plastic surface, and it puts vac-metallizing to shame. The only time I've ever seen a similar look was on high end plastic and die-cast car models, on pieces that were meant to mimic chrome or brushed aluminum. I imagine the technique is infinitely more expensive than vac-metallizing, but that's the beauty of a high end figure like this: there's no such thing as cost-effectiveness. I'm not sure about the exact number of articulation points on this figure, because some of them ended up being covered by armor, but the number and placement of the joints is very reminiscent of Marvel Legends. The figure has all the favorite joints, balljointed shoulders, chest, hips, wrists, neck, double-hinged knees and elbows, bicep and thigh pegs, hinged ankles, even a pectoral joint on each side of the shoulder that allows forward and backward motion. All the joints are tight, but not so much that they're difficult to manipulate. With so many joints, I expected one or two to be loose, even at this price point, but amazingly that was not the case. Unfortunately though, due to the figure's outfit, some joints are slightly restricted. The shoulders and hips don't have a full range of motion due to the armor plating, and the head doesn't move as far forward as I'd like. The ankles also suffer as a result of the shin and calf armor. Despite, or perhaps because of, the restricted ankles, the figure stands remarkably well and holds its position indefinitely (or at least as long as I was willing to leave such a pricey piece of plastic standing without some support). Nevertheless, a base is included, stamped with the AvP logo. A metal clasp loosely supports the figure's waist, ensuring that it won't topple, thank God. If I woke up to a crashing noise and found this guy in pieces on the floor, I'd be likely to shed tears. Lots of them. In addition to the base, there are all sorts of other goodies. Celtic gets two detachable forearm blades, one of those weird Predator throwing-star blade thingies [a glaive. --ed. ], and a dagger. There's also a retracted throwing blade that fits on his belt via a rope, and a sheath for the dagger. All the bladed bits feature the chromed look I mentioned before. He's also got a necklace of trophy skulls, which you better remember to put on before attaching the head, unless you want to attach the head twice. Then there's his spear. Remember what I said about cost-effectiveness going out the window? This baby retracts, baby. It also clips on his back. He also has his shoulder cannon, which is nice, although he never really got to use it in the movie. Only Scar Predator ever gets his hands on his shoulder cannon. Come to think of it, Chopper Predator is the only one to use the forearm blades. Oh well. The arm connecting the cannon to the armor moves in four places, and there's a nifty pump action sliding joint on the barrel. He also gets two sets of hands. One is semi-closed for accessory grasping, and the other set features bendy articulated fingers that can be posed to your liking. I found this particularly nifty, not because I've never seen bendy fingers before, but because I've never seen bendy figures that function properly before. These do. But that's not all. There are all sorts of bells and whistles that deserve a mention. For example, every single hair on Celtic's head that's thick enough features a bendy wire allowing it to be posed however you like. Amazing, no? On his right gauntlet are retractable claws that extend not once, but twice. Two tightly coiled metal springs mimic the hoses that connect the mask to the figure's backpack assembly (although I just remembered in a brief flashback to the horrifying assembly period, the springs were taped down and the adhesive left a rather gooey mess that was a bear to scrub off the metal coils). The eye lenses of the mask are a separate piece of heavily tinted clear plastic, so that they really look like what they're supposed to look like. I could go on and on about this figure. 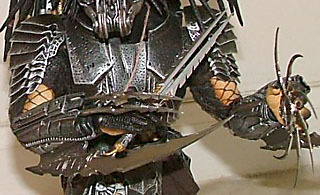 To me, it is the ultimate Predator collectible. It looks just as good as a statue, but you can actually play with this guy! It's sick how cool this thing is. It's rare to find a high end collectible that actually seems like it might be fun, but that definitely describes this. However, the burning question: despite all the praise, is it really worth $130? A hundred beans more than McFarlane's attempt at a sixth-scale Predator? I'll say this... comparing this figure to the McFarlane version is like comparing the McFarlane version to the old Kenner Predators. Like the man said... if you fancy yourself a Predator fan, you'll find a way to make it happen. Go without food for a week. Sell all your other toys. Pawn an heirloom. Turn tricks. Just make it happen. You won't regret it... unless it breaks. Then you'll probably regret being born. But during that sweet period of time, after you've assembled it and before your dog knocks it off the shelf, you'll be in heaven. Have you faced your rite of passage? What was it? Tell us on our message board, The Loafing Lounge.